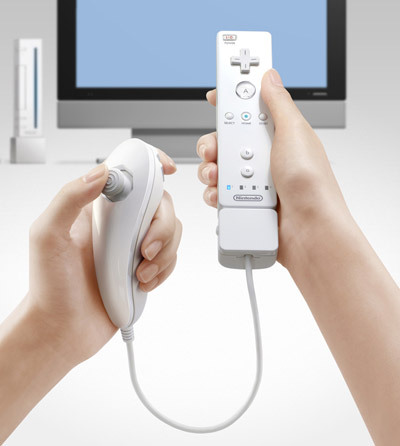 "Last week, a rumor hit the net claiming that the Nintendo Revolution’s nunchaku controller features a built-in acellerometer allowing it to sense it being tilted left or right, or being moved up, down, left, right and in a number of other directions as well. One example we’ve come up to describe how this function will be useful in future software involves a first-person shooter, in which you use the free-hand controller to look around and aim, while you use the nunchaku controllers analog stick to move around and strafe. Most importantly, you’d be able to tilt the nunchaku controller to the left or right to reload your weapon. More intriguing than all this, perhaps, our source told us that this “feature” of the nunchaku controller has been in their development kits since they first received them over six months ago. This raises the question, of course, is this the second big secret function of the Revolution controller? It could be. However, it’s odd that developers have had access to the feature and information all along, without ever being told to keep the information under wraps. Nintendo Revolution will be in full playable form during the Electronic Entertainment Expo., which kicks off May 9, 2006 with Nintendo’s annual press briefing. AMN will be on hand at the event with full coverage." I'm really curious to get my hands on this thing to see for myself if controling a First Person Shooter will be better or worse with this. Looking around, and moving around all in the same hand? Nintendo had to have tested this to make sure it felt comfortable, because it sounds like it might be complicated. Regardless, it looks like a really good choice for sword fighting games......Star Wars anyone? I'm not sure I buy this just yet. It seems too likely that you may move the nunchuck left just as you move the freehand unit right, pulling the cord tight and damaging it. More likely is that the nuncheck simply contains a rumble feature or something like that so you get feedback on both hands. The gyros in both just seems like the units would need to remove the connecting wire for it to work. Well the concept of the Nunchaku sensor is sound, I just wonder how well it would work. This is Nintendo though so I bet they will figure out a way.